The folks at Heart of Brooklyn have been doing a lot of great work for the area recently, and their latest initiative is an inspired way to show off the neighborhood's burgeoning retail, bar, and restaurant scene and give locals a free ride on a Saturday night. Target First Saturdays at the Brooklyn Museum return this weekend, and Heart of Brooklyn will be running a free shuttle from the event throughout Prospect Heights (with a brief stop at St. John's and Classon, on the edge of Crown Heights). The complete schedule is here, and a map of the route is above. Guides on the shuttle will be providing recommendations for shops, restaurants, and bars in the area, as well as handing out maps and discounts. If you're a local merchant and you want to be mentioned, contact HoB here (they've already got a nice page of local business info here). If you're just a resident looking for a fun Saturday night, let Heart of Brooklyn drive you around and give you some great discounts at local spots that you'd probably hit anyway. Two citywide primary races go back to the polls tomorrow as required by city statue, because no candidate earned 40% of the vote in the initial primary. Bill de Blasio, the former District 39 Councilman, is up against Mark Green for public advocate, an office Green held before his run for mayor against Bloomberg in 2001. In the race for comptroller, John Liu is looking to carry his first-place momentum from the primary into a runoff with the better-endorsed David Yassky. There are plenty of economists who will tell you that a rational individual will, in theory, abstain from voting, based on the simple arithmetic of cost-benefit analysis. While there are plenty of ways to explain why people vote anyway, which range from arguments about the "social benefit" of doing your civic duty to plain human herd behavior, even the cost-benefit calculus shifts significantly in NYC's primary runoffs, where voter turnout is so minuscule as to actually make your vote "count" quite a bit more than it usually does. This is particularly true given that these are very close races, victory in the Democratic primary in NYC is tantamount to winning the general election, and these two positions, while not necessarily well-reported year in and year out, are often stepping stones to higher offices and also happen to be the first and second positions in line for succession should something unfortunate befall the mayor (maybe he'll overdose on salt). In short, surprisingly few people will vote tomorrow for something that matters more than media coverage would suggest. The duties of comptroller and public advocate are worth examining, as are the candidate websites (above) and the various endorsements, which are usually linked or posted thereon. You can also find analysis on BoroPolitics and PolitickerNY, as well as the major news outlets. I'll abstain from a full-on endorsement, though I'm happy to say I'll be voting for de Blasio and Yassky. It takes only a few minutes: read up by clicking around, make a decision, look up your polling place (you'll be surprised how close by it is) and go vote! 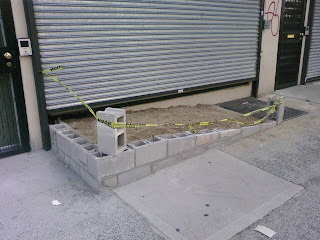 - The incoming dentist's office on Franklin between Park and Sterling has built a ramp to accommodate disabled customers, in accordance with local statues. - The Slice, which has been absolutely hopping all summer much to my great delight, is bringing in bread bowl soups for the chilly autumn weather. Judy, Elwin and company plan to offer Manhattan clam chowder, lentil, and daily specials. - The new takeout Chinese place coming in at Park and Franklin is taking shape, with their stoves and sinks being delivered last week. 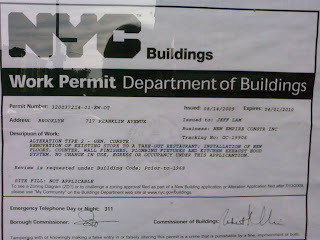 - Followers of Brooklynian will know that not one but two coffee shops will be opening soon on Franklin. 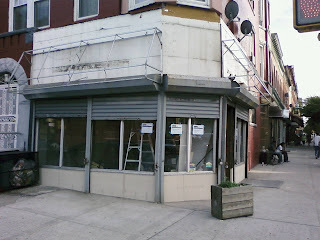 The Breukelen Coffee Shop plans to hold their grand opening on Saturday, October 3rd. You can follow the Pulp and Bean on Twitter for up-to-the-minute notes on their progress. - Praxis, a citywide non-profit that provides housing for chronically homeless people with HIV/AIDS, chemical dependency, and other mental health issues, just bought the Lincoln Place Hotel on Lincoln and Rodgers, which they have rented for their operations since 1999. Their plans for the space include renovating it as a green building and providing more units of transitional housing (it currently shelters 40 adults). Shepherd Avenue, Cypress Hills. What happens if you pick up the mail and sit down to read it on your porch? It's hard to mind Manhattan when the central borough provides Brooklyn (the mightiest borough) with such nice views. Pulaski was probably the most famous Polish-American in history, the "father of American cavalry." Coming in a close second is Kosciusko, for whom the other Newtown Creek span is named. Despite earning an "ugh" of disapproval from an anonymous poster, the celebration at the Walt L. Shamel Community Garden on Dean this past Sunday was a great time. The weather was perfect, the garden was verdant, and they had a kiddie pool full of rose petals. Allow me to repeat that--they had a kiddie pool of rose petals! The closest thing I've ever seen to an organic reincarnation of the Chuck E. Cheese ball pit, the pool of roses was a huge hit. Rose petals are soft, fragrant, colorful, and durable. You can wallow in them without a care, or do flying leaps into them if you're under the age of 12-ish. You can throw them in the air and let them come fluttering down all over you, and if you're the one little kid in attendance, you can command an audience of bemused 20- and 30-somethings for a solid hour by doing all of these things with great gusto while screaming "Waaaaaaaooooooooooooeeeeeeeeeeeee!" From now on, my answer to anything that includes the phrase "kiddie pool full of rose petals" is yes. The event was excellent beyond this attraction, of course--food was cheap and tasty and the music was wonderful (I failed to get the name of a woman who put on a spectacular one-woman show with a violin, pickup, and delay pedals). I did get a chance to talk to the guys selling the beads pictured above, mushana, which are made from recycled paper in Uganda. Check them out here. Along with UN Peace Day, Sunday and Monday marked the celebration of Eid in the Muslim world, which includes a sizeable portion of our own neighborhood's residents. Many locals gathered at Bedford and Fulton to break the fast of Ramadan, and you can get a feel for the joyous mood from this Flickr photoset, taken in 2008. Tony from Fisher's let me know that the holiday was this weekend, as did the gentlemen at Bombay Masala (if you like their food as much as I do, help them out and give them a great review on Yelp! ), who were dressed in their finest for the occasion. Eid has been celebrated in Brooklyn for decades, of course, including at Coney Island, where this spectacular photo was taken years ago. Last week's Franklin Flea was rained out, but the weather co-operated this Saturday for another great day of fun at the market. The vendors I profiled two weeks ago were all back (with the exception of the Cain Brothers), as were the individuals selling the wares pictured above. - Outside the fence on Franklin, Stacey has a table of semi-precious and costume jewelry that she collects from jewelers and craftsmen/women at trade shows. The Franklin Flea is her first such gig, branching out from the jewelery parties she hosts. - Over Stacey's shoulder just inside the fence, Jackie and Freddie keep their own booths, both of which offer of various clothing, toys, appliances, and bric-a-brac at what Freddie promises are "very reasonable prices." While their wares are similar, their sources differ; Jackie's collection is primarily her own, acquired over the years and through friends who have items to sell, while Freddie purchases his clothing and many other items from overstocked wholesalers. - Around the corner, Amanda sells her own leather handiwork and handmade girls' dresses in festive summer prints alongside loose cotton clothing, leather sandals, and bone-and-wood jewelery from Brazil. - Along the back wall, Kevin (the artist known as Kev) has an array of his own original prints and drawings for sale, whose subject matter ranges from classically-proportioned archangels in flight to current figures in world politics. Rendered mostly in colored pencil, and often in black and white with colors added for accent or background effect, the works were priced well below even the art found in Union Square, in an effort, Kevin said, "to make this available to people in the neighborhood, people who might actually walk in here." As to his work, Kevin added "I've been doing this since I was 4 years old . . . I try to incorporate as much as I can into this, politics, religion, whatever it is, to have something for everyone." Last time I wrote about the market, I was struck by the camaraderie of the marketeers and the strength of the social network they've developed, a network that includes local merchants as well as the stall-tenders and their customers. This time out, I realized that almost every vendor at the market is using it to try out their wares for the first time, to experiment, to go out on a limb. Much as Frank and Jason noted explicitly when I talked to them two weeks ago, Stacey, Kevin, and Amanda all mentioned that this was their first time selling their work in this sort of context, and that they were enjoying the experience. Flea markets rarely make their way into discussions of the entrepreneurial spirit, but right here in Crown Heights, in the middle of a recession that has by no means spared Brooklyn, a whole host of neighbors are making their first foray into their own businesses, engaging their passions and getting themselves out there. The Flea may continue on into October, pending discussions with merchants and organizers, but next week's installment is the last sure thing of the year. Don't miss it! 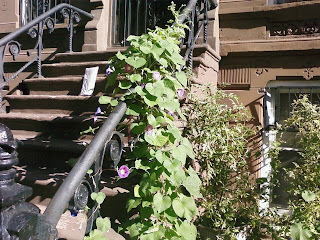 I was greeted on my way out by the supercharged morning glory that my neighbors have planted, which is rapidly engulfing our railing in green and purple (these things grow so fast they're illegal in some states--well, that and their seeds have hallucinogenic properties). It's a gorgeous morning here in Crown Heights, and it's supposed to stay this way all weekend (75 and sunny all day both days!). Get out and enjoy the last gasp of summer while you can with some great local events today and tomorrow. - Today, check out the Franklin Flea, which is still going strong and has LOTS to offer. If you see an awkward-looking guy peppering people with questions and taking pictures, it might be me. - Tomorrow, partially in response to the latest unfortunate gunplay in our neighborhood, but also as a part of the UN's International Day of Peace, the Kakini Health Center is hosting Peace and Healing in the Garden, an all-day event that promises great food, music, art, meditation, yoga, a workshop on herbal remedies (including herbal ales), and much more--in short, something wonderful for everybody. I'm copying their press release below, but check the Be Wild Woman or Kakini Healing Center blogs for the latest info. - Finally, a shameless plug: an old friend has revived his blog. You'll laugh. I promise. Join us as we raise awareness & $ to promote peace in nyc and arround the world! Your donations will go to support The Global Mala Peace Project, Be Wild Woman's Wombing Project, and the Walt Shamel Community Garden. Be Wild Woman Herbal Remedies to Keep the Doctor Away! *Herbal Ale, Wine, Vinegar, & Hot Cayenne..to stave off the plague and bring back passion. comfort foods and delectable delights from our community gardeners! handcrafted by Ugandan Widows with 100% recyclable materials. We are proudly serving Stumptown Organic Coffee, and organic nut milks (almond,hazelnut), oat and hemp milk. Milk will not be available nor conventional sugar. We will only be serving non processed, all natural sweetners such as stevia, agave syrup and Manuka honey. Our pastries will include vegan options, and we'll have delicious smoothies! Equally important are the holistic workshops we'll be holding. They will focus on helping people to 'remember' proper breath, proper hydration and eating with 'life foods'. Our motto is: Order anything/everything of our menu! None of it is bad for you! Guilt-free eating is where we pride ourselves. I'm excited--here's hoping that they succeed! Provided they thrive, I'm also hoping that they can eventually extend those hours, both for the early-morning crowd that needs a jolt (I could have used one when I got up at 5 AM to open the polls this morning) and for the evening crowd that would sit around sipping coffee and reading until 10 or later. P.S. - Remember to VOTE today! Polls are open until 9 PM. P.P.S. - Great show last night at the Franklin Park Reading Series--thanks to all who read, organized, and attended! I walked out my door on Saturday and saw FDNY Ladder 132 stretching its single tentacle towards the roof of the old Budweiser/Nassau Brewery on Franklin between Bergen and Dean. At first, I thought the place was on fire, but the lack of sirens, lights, or hoses put me off that scent pretty quickly. I headed back upstairs for my camera, as it seemed like a story was brewing, but by the time I was back down all the firefighters were on the roof, and it seemed inappropriate to start yelling up at them ("Hey, got a second to stop saving whatever you're saving and give me a quote for the blog?" Not so much. ), so I kept moving. Later in the night, I walked by their station on St. John's and poked my head in to ask about the incident. The guys on duty told me that they hadn't heard anything specific, but that they "use that building to practice" with some regularity. Nice to know the old place still serves some purpose, though I still think it would make a tremendous brewpub. Following from I Love Franklin Ave's first rule of blogging (never title a post without a pun if one presents itself), I'm fired up for my third consecutive Franklin Park Reading Series event tomorrow night at 8pm. This week's readers include Susan Shapiro (here's her NYTimes piece that ran yesterday), Times editor Frank Flaherty (he's just authored a book on non-fiction writing), and a pair of young guns--Royal Young and Lori Bizzoco--from Pomp and Circumstance Magazine. Don't miss it! 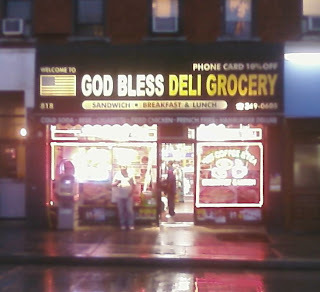 Because, at some level, Deli Grocery is synonymous with New York. Franklin Park Reading Series in Time Out! Kudos to Penina Roth and the Franklin Park Reading Series, which made Time Out New York's Books section this week. I've attended the last two events in the series, which I reviewed here and here, and I'm a huge fan. The atmosphere in Franklin Park's big room is cozy and friendly, the attendees are unpretentious and genuinely interested in what the readers are saying, and the readers themselves have been fantastic across their genres and topics, offering up 15-20 minute segments of their work that have caught my interest every time. So come on out next week (Time Out's got the key information). You'll likely meet some cool people, learn a thing or two about Brooklyn (our fabulous hostess tends to make sure NYC's largest borough gets some love), hear some fresh ideas, and have a tasty beer. The full lineup can be found here. I stopped by the Franklin Flea on Saturday to check out the scene, and didn't leave for over an hour. The nascent market remains small and even sparsely populated by more established flea market standards, but there are still great finds to be had and wonderful people to talk to. Asking around about the success of the inaugural year, merchant after merchant gave me the same response: hawking our wares has been fun, but we're sticking around because we love the community of people we've shared the summer with. The sentiment makes for an inviting, laid-back vibe, with vendors treating one another more like colleagues than competition. My first stop was The Pour Gourmet table, whose fantastic sauces/glazes/marinades I first sampled back in May. When I showed up then, I tasted three creations, but this time there were five available, which executive chef Jason Hait called his "all-stars," including my new favorite, Beer-B-Q, a barbeque sauced simmered in Guinness that I could have eaten with a spoon. Jason offered me a seat and poured out a tall glass of raspberry lemonade (a steal at $2 - the glass was easily 20oz.) while telling me how the Pour Gourmet has official gone international (some Norwegians discovered them!) and how much fun he's had at the Flea this summer. After I'd drained my glass, Jason proceeded to introduce me around to the other merchants, starting with some of his suppliers (all of his products are made with locally-available ingredients right here in Crown Heights), the Cain Brothers. These Brooklyn natives have been gardening for a long time, and a few years ago, they invested in a small farm up in Saugerties, NY, where they grow an assortment of organic produce to sell at local markets. They had been selling in East New York and Brownsville when the Franklin Flea came calling. My next stop was the Planet Ert table (first two photos above), where co-owner Danyel showed me through their impressive selection of crafts made with recycled/found materials. Wares included wallets made from potato chip bags, recycled paper notebooks and notecards, Darth-Vader-head candles (molded from a discarded action figure), and the umbrellas shading it all, composed of found wood and painted canvas. Carleen Haughton of Bristen's Eatery, the flea's founder, liked the last item so much that she bought a few for her restaurant's garden. Danyel was as effusive as Jason about her time at the Flea, saying what a wonderful experience it has been so far. As to her own enterprise, which she shares with boyfriend/partner/founder Robert Heller, she said "it's about giving gifts, finding joy in what's around us." Holding a notecard of paper made in her home, she added "Everyone sends email now, but when you see this kind of envelope, you know it's special." I started to head out after this chat, but Jason wouldn't let me leave without checking in with Frank, who had been playing bubbles with another vendor's daughter when I arrived. An avid reader, Frank retired and made himself a vinyl book cover with his mother's sewing machine one day a few years ago, and withing a few days had been told by more than one person that he should think about making, and selling more. "I may be slow, but I'm thorough" laughed Frank, as he showed me what has become a labor of love for him, piles of perfectly-stitched book covers (each lined inside and out, and with a built-in bookmark) and wallets bearing the flags of nearly every nation in the Western Hemisphere. His work is so meticulous as to almost seem the product of a much larger operation, and Frank smiles about his ability to produce them. "I could create hundreds of these for a school fundraiser, for instance" he said, pondering ways to share his creations. For more thoughts and photos of the Franklin Flea, check out Nostrand Park and Brooklyn Born, both of whom were smart enough to swing by on the day that Bristen's offered free smoothies earlier this summer. If you haven't made it yet, the Flea is certainly going to run until the last weekend in September, and may continue into October if the weather holds, so block out some time this Saturday and check it out! Click any photo above for a larger image. If you want more, Nostrand Park has an excellent gallery posted here. This was my first time at Brooklyn's legendary West Indian American Day Carnival, and it blew me away. The experience was total sensory overload of the best kind; colors, sounds, and aromas resplendent with joy everywhere I turned. Everyone I encountered was in great spirits, not that it was hard to enjoy the day and the perfect weather. I also had a blast on my morning run by taking advantage of street closures to run down Lincoln to Buffalo and back on St. John's marathon-style, in the middle of the street. It was a great tour of the festivities, and I got some fantastic cheers (as well as offers of food and drink) on the way. You can read plenty about the Carnival if you search around, but two useful links I found were the official WIADCA organizers' site and this quick, thorough little history from the Brooklyn Public Library. Drawing up to three million people annually, the celebration is the largest of its kind outside the Caribbean, narrowly edging London's slightly-longer-running Notting Hill Carnival, held a week prior. Depending on who you ask, it may also be NYC's largest parade/street festival. Not bad, Crown Heights, not bad at all. Demerara West Indian Cafe at Park Place and Franklin folded earlier this summer, and in the last two weeks a full-scale renovation has been taking place in their old space. I stopped by today and asked the workers inside what's on the way, and they told me that the storefront is being converted to a Chinese take-out/delivery place. There's no dearth of Caribbean cuisine to be had on Franklin, which may have led to Demerara's demise. 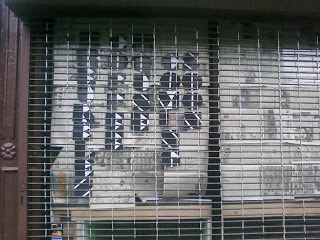 However, there are also two Chinese take-out joints, including one right across Park next to the laundromat. Time will tell how this one fares, though I confess I was hoping for something more novel. On the plus side, it's a good sign for the neighborhood that retail spaces are being snapped up this quickly despite the recession. Finally, I saw the mounted police out on Sterling today. They looked a little lost, without a crowd. 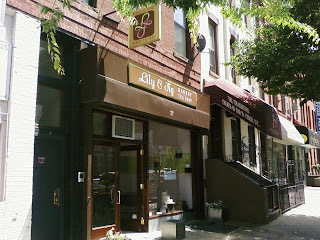 Lily and Fig Bakery and Tea Shop has been open for a nearly two months now, and I think it's still a secret that they make the best chocolate chip cookie in the neighborhood. I promise you, you will not be disappointed if you try these cookies: they're crunchy but not too crispy on the outside, soft but not too greasy-moist or raw-dough-chewy on the inside, they're sized just right (neither a teeny bite nor a monstrous undertaking . . . cookies seem to tend towards extremes in these parts), they have plenty of chocolate chips (chunks, really), and they cost one one dollar. You can't even get a candy bar for under a dollar at Duane Reade anymore! So go in and have a taste, Franklin Avenue residents, and you'll get the added bonus of chatting with Lily and Ike, two of the friendliest proprietors I've had the pleasure of purchasing from recently. They remind me a lot of Judith and Elwin, another great team two blocks down at A Slice of Brooklyn. I hope their business follows the same trajectory--the Slice started slow after a grand opening in July 2008, and a year later the place is routinely hopping around mealtime. Nothing makes me feel at home like knowing the names of the people I buy from. - A buddy who works on urban policy in DC (and takes a mean photo) passed along this map of Brooklyn block groups, which I like to classify as one of those tiny hinges on which quality of life can swing so far (other such hinges include community gardens and almost everything the guys on Streetsblog write about). - The same buddy recommends a new metro policy blog from The New Republic, the Avenue. - Herbert T. raises an interesting point in response to Monday's post on the police presence on Franklin: perhaps the quieter stoops are a product of the violence (no one wants to be a bystander) rather than the increased patrols. The answer is likely somewhere in the middle, though I'm inclined to think the officers are having more of an effect than Mr. T. After all, today I saw (on Franklin) two beat cops at Eastern Parkway, two at Lincoln, one standing outside the Skywatch at St. John's, two at Prospect, a cruiser at St. Marks, the Mobile Command Center, the Interceptor, and another cruiser at Bergen, and two more officers on the beat at Dean, and that was just walking home in broad daylight at 7:30 pm. - The Franklin Park Reading Series returns in less than two weeks, thanks to the tireless efforts of local literary hostess extraordinaire Penina Roth. I'll run a more detailed preview next week, but in the meantime, mark your calendar for Monday, September 14th at 8:00 PM, and check out the lineup here. 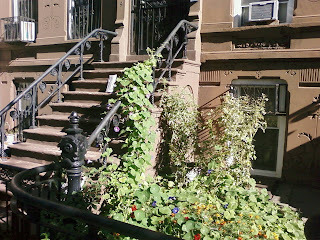 One of my favorite work-related bike rides takes me down Bedford from Crown Heights through Prospect-Lefferts Gardens and Flatbush, past all the cute little houses that swim in a sea of foliage this time of year. A remarkably residential street in this part of town, Bedford briefly becomes part of a bustling city again at Church Avenue, a block from the historic center of Flatbush. It's on this corner that I always pass the building in the second photo, below, which always had a schoolhouse feel to me but isn't part of the Erasmus Hall complex that looms in the background. Normally I don't blog Bedford, as Forgotten-NY has done such a thorough job, but even this notably comprehensive blog was stumped by the decaying brick structure. 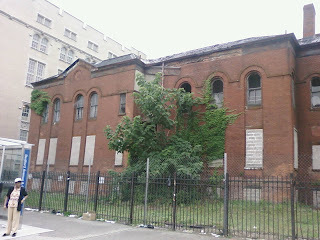 The best guess offered on that link is "The building on the SW corner of Church and Bedford has always mystified me -- it's been abandoned for many years, yet it looks like it was built around 1900 and may have been a building of some importance. 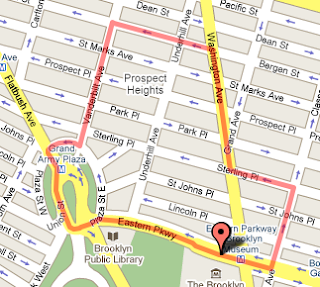 Does it date to the era of Flatbush Village, or [was it] perhaps a school of some kind?" PShark wasn't much more help--they too identified the building as a school, but claim it was built as late as 1930, which just seems wrong for the architecture. Finally, after several futile searches, I hit the mother lode, this neat one-page summary from a 2007 Landmarks Preservation Commission hearing. 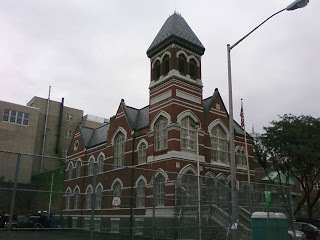 Built in 1878 as Flatbush District School #1, the structure was a companion structure to the Flatbush Town Hall of 1874-5, which sits a block down and is beautifully preserved as part of the DOE complex that takes up much of this block (first photo). The pair were designed by John Y. Cuyler, a descended of original Flatbush Dutchmen who also acted as Prospect Park's first superintendent and chief engineer. The building became Brooklyn PS 90 in 1894, and presumably got another number in 1898, though it continued to serve as a public school until 1951. It was operation as a Jewish private school into the 1990s, but today, it's in bad shape. 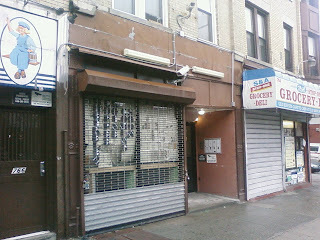 One thing I think PShark has right is that the building has still not received any historic designation, and remains city-owned, despite the efforts of a local Caribbean organization to buy and restore it (see the hearing report above). This puts me in the same mindset that the NYTimes was earlier this year when it blasted the slow-moving, opaque decision-making of the LPC--why haven't they preserved this building? The rest of old Flatbush Village looks great, including the Town Hall, and the city has apparently had private offers to restore it, so I'm stumped. I know there's no money around right now to clean it up, but leaving it to crumble away for so long seems a rather needless waste of what could be a lovely addition to an already well-preserved and historic neighborhood.